Lord of War is a 2005 crime drama written, produced, and directed by Andrew Niccol, and co-produced by and starring Nicolas Cage. It was released in the United States on September 16, 2005, with the DVD following on January 17, 2006 and the Blu-ray Disc on July 27, 2006. Cage plays an illegal arms dealer, inspired by the stories of several real-life arms dealers and smugglers. 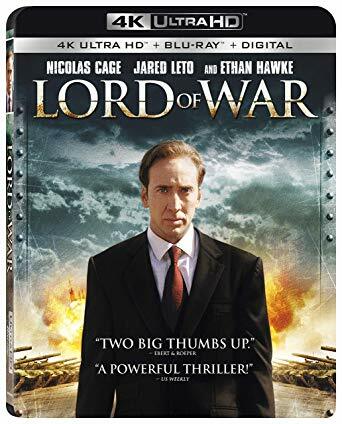 Purchase LORD OF WAR on Ultra HD Blu-ray Today! Lord of War is one of the better films of Nicolas Cage’s career despite the fact that many critics sit on both sides of the fence with this one. Some praise the film, while others not so much. I for one just so happen to fall on the side of the fence of praise. I liked the film since its release and perhaps the multitude of bombs that Cage went on to later release made this one shine more than it should. However in the end the film is shot well, tells a great story, and is just flat out fun to watch. Cage plays Yuri Orlov (based on real life story of Viktor Bout) who is an arms dealer married to a model living a life of luxury in New York hiding the fact that he is such from his wife in an attempt to live or better yet portray a normal life. All the while Yuri is making insane deals for large amounts of guns, ammo, and huge arsenals to warlords, dictators, and governments. Lord of War comes to Ultra HD Blu-ray from Lionsgate with beautiful Dolby Vision. There’s quite the number of outdoor shots that allow for Dolby Vision to really show off it’s power in capturing and utilizing a wider gamut. Deeper darks and brighter colors allow for a more rich picture. Another step up for Lord of War is that of its audio tracks. Here we have what was already a stellar track in the blu-ray disc, but with Dolby Atmos and it really helps showcase Lord of War in that some of the gun firing just rings out all the better. If you’re set up as such in your home theater or viewing experience with 5.1 or at least a quality sound bar then you’ll likely hear the difference in this film. It’s quite immersive in how the Director artistically uses sound.